The Southeast has such amazing landscapes, but I think some of the best for photography have to be peach orchards. The orchards blossom every year sometime in March or April, with the deep pink blooms blooming before the leaves come in. 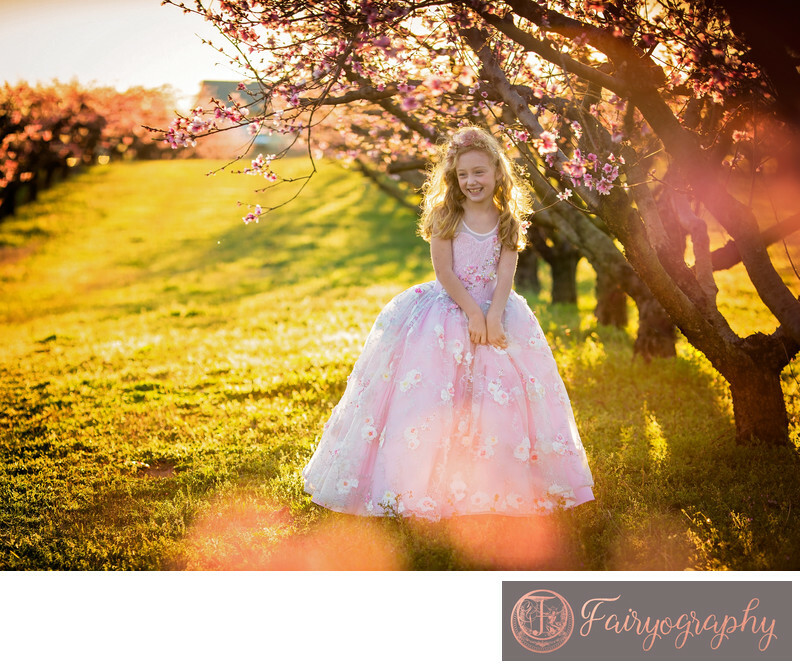 The backdrop of the orchards make for a perfect princess photo session! If you're looking for a child photographer, chances are good that you want something unique for your kid, but also something timeless enough to hang on your walls for years to come. Being a child photographer lets me take these moments and make them memories. I love the experience that each girl has at a Fairyography photo session. For example, this little girl was pretty shy when she showed up at the orchards. But it's absolutely impossible not to have fun when you're twirling in a big dress or jumping. There's a quite I love. It's "There's no such thing as a mirthless jump." Really, try it. Right now. Stand up, and jump up and down a few times. I dare you. You've got a smile on your face right now, don't you? See, I told you. Now imagine that you're a little girl. You've had your hair done at a salon in Five Points, and you know you look amazing. You even got your nails painted and you're wearing mascara for the first time in your life. You meet up with this wacky photographer at a gorgeous orchard. The warm wind is gently blowing, the peach blossoms are pink all over the place. You're wearing a huge ballgown and it twirls like magic. Now this crazy photographer tells you to jump up and down.. then asks you if you farted. Oh my goodness, you're going to remember that for a long time! For this photo, I picked a custom made cherry blossom dress from Ella Dynae, an American designer dress brand with a very regal princess look. The royal ballgown goes perfectly with the pink flowers on the trees. I love the sunlight steaming through the orchard and this girl's hair. Location: Thomas Orchards 6091 Macon Hwy, Watkinsville, GA 30621. Keywords: Thomas Orchards (24). 1/250; f/3.2; ISO 160; 135.0 mm.